ATTENTION, BOOKING IN THE APARTMENTS IS CARRYING OUT OF 2 DAYS !!! AT THE BOOKING DURING THE PERIOD OF THE EXHIBITION, THE BOOK IS ACCEPTED MINIMUM FROM 3 DAYS !!! 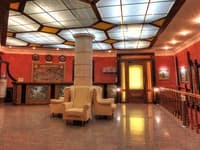 The Mini Domashny Uyut Hotel is located a 20-minute walk from the Levoberezhnaya metro station, near the Dnieper River. 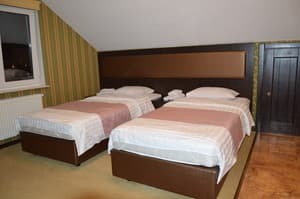 The four-storey mini hotel consists of 12 rooms, each of which is equipped with comfortable furniture, TV, air conditioning, kitchenette, free Wi-Fi access. 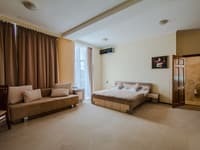 Living in the hotel "Domashny Uyut" have the opportunity to take advantage of additional payment for laundry and ironing services, as well as book a transfer to / from Zhulyany, Borispol airports. Free private parking is available on site. 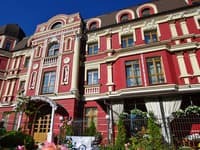 Near the house there are bus stops and supermarkets "Novus" and "Fourchette"; close to the International Exhibition Center (ICC) on Brovarsky Prospekt, SEC "Komod", the market, cinemas, cafes and restaurants. The distance to the city center is 8 km, the railway station is 10 km, the airport Borispol is 30 km, the airport Zhulyany is 18 km. Description of the room: ATTENTION, BOOKING IN THE APARTMENTS IS CARRYING OUT OF 2 DAYS !!! 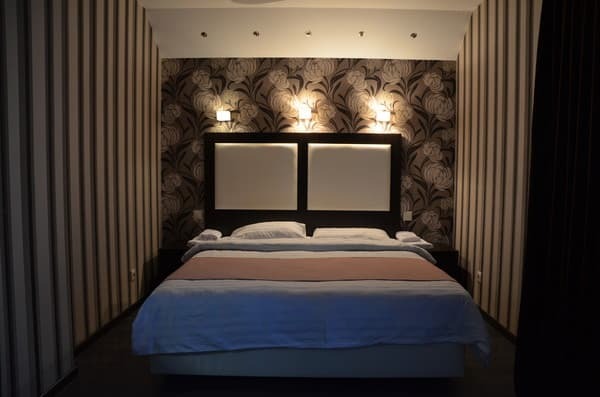 One-room studio apartment, equipped with everything necessary for a comfortable stay. Description of the room: ATTENTION, BOOKING IN THE APARTMENTS IS CARRYING OUT OF 2 DAYS !!! One-room studio apartment, decorated in blue tones. 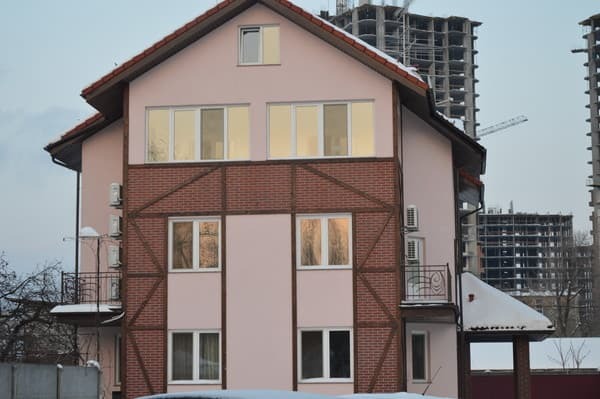 The area of ​​the apartment is 35 sq.m. The apartments are located on the ground floor. Description of the room: ATTENTION, BOOKING IN THE APARTMENTS IS CARRYING OUT OF 2 DAYS !!! One-room studio apartment of 30 sq.m., equipped with a double bed, a kitchenette and everything necessary for a comfortable stay. Description of the room: ATTENTION, BOOKING IN THE APARTMENTS IS CARRYING OUT OF 2 DAYS !!! Studio apartment of 30 sq.m. The apartment is equipped with a kitchenette, a double bed and all necessary for comfortable living with accessories. Description of the room: ATTENTION, BOOKING IN THE APARTMENTS IS CARRYING OUT OF 2 DAYS !!! Two-room apartments, designed in bright colors. 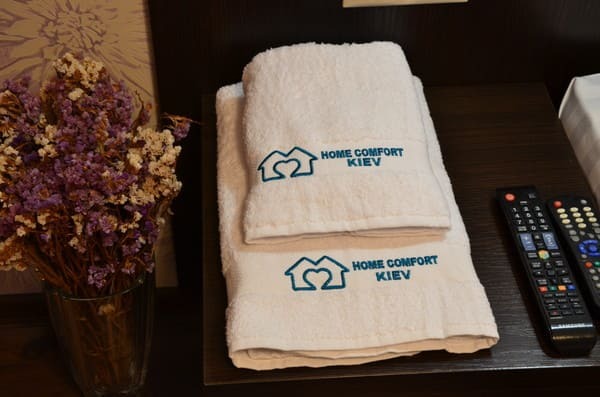 The apartment is equipped with all necessary accessories for comfortable living. The apartment area is 80 square meters. m.
Хозяева. 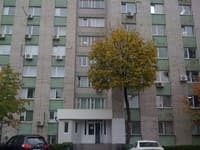 На просьбу увеличения тепла в номере сначала было обещано увеличить. Через несколько часов, так как не прошло изменения, произошла повторная просьба, был гениальный ответ " и так тепло"! Не удобная узкая лестница если выпадет один из верхних этажей, о этаже не предупреждают. В общем не советую. The cost of additional space is 50 UAH. You can order breakfast, extra charge. Check the price for the reservation. 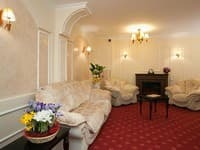 The hotel is located 20 minutes walk from the station. Metro station Levoberezhnaya. The distance to the city center is 8 km, the railway station is 10 km, the airport Borispol is 30 km, the airport Zhulyany is 18 km. From the railway and bus station is most convenient to go by subway to the station. "Left Bank". From the airport Boryspil to metro station "Borispolskaya" or railway station, then by metro to the station. "Left Bank". From Art. Metro "Levoberezhnaya" can be reached by bus number 95 (go to the final), or on any fixed-route taxi that goes to the street. Lunacharsky - № 599,178,179. Taxi from the station. Metro "Levoberezhny" to the apartment - 25 UAH.